The property is located within walking distance from the white sandy beach in a well maintained complex. Villa 'Lumy' is a corner bungalow on the middle level. The living room is about 50 square meters and has music system and flat-screen TV, a generously equipped Siemens kitchen and a dining area. Internet access is possible via a wireless connection. The invisible Patio with private pool is equipped with furniture and umbrella. It has 2 bedrooms with large closet. 1 bedroom has air conditioning (with heating possibility). The spacious bathroom includes a shower, toilet and bidet. 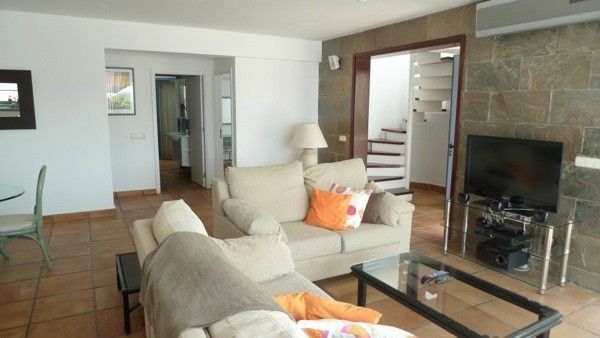 Above you can reach the partially covered sun terrace with fantastic sea views over the bay of Costa Calma. Here you can comfortably eat and start the day relaxing and winding down. The bungalow is fully furnished, fully functional, including linen, towels, etc. The towels are not allowed at the beach. To do this, bring their own beach towels. Sehr schönes und sauberes Ferienhaus mit Blick auf das Meer. Würden nochmals kommen! Wir haben die unteren beiden Schlafzimmer genutzt, die beide mit einer Klimaanlage ausgestattet waren, so dass es nachts auch kühl war. Auf der Terasse hat es abends ziemlich gezogen, so dass man sich auf jeden Fall einen Pulli mit nehmen sollte. Ansonsten hat uns Fuerteventura gut gefallen.und wir können die Villa Lumy weiter empfehlen. On the Costa Calma the approximately 25-kilometer-long sandy beach begins. All year round you can practice many sports facilities at a consistently pleasant climate. The water temperatures are almost always between 19-24 degrees, even on Christmas. Extensive shopping, good restaurants, several rental locations for individual island tours are just a few minutes. Not without reason the Costa Calma is a very popular destination also for long stays. Here you can relax "hibernate" when you book in good time. Preise sind für Belegung mit zwei Personen, jede weitere Person pro Tag 15,00 € mehr. Einmalige Endreinigungskosten 105,00 €. Fragen Sie nach unseren Sonderangeboten für eine längere Anmietung ab 4 Wochen.